GD/ACLS8000D is a more complete comprehensive emergency skills training system basing on GD/ACLS8000C. 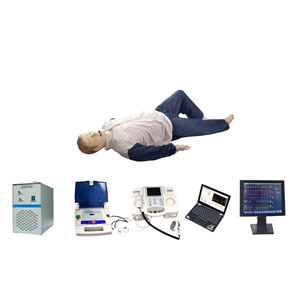 Besides of all the functions of GD/ACLS8000C, the product focuses on the expansion of hospital emergency training. It can act multiple arterial pulse examination, spontaneous respiration, common clinical puncture training and auxiliary examination and vividly simulate all the related pre-hospital and hospital body signs, treatment measures and auxiliary examination of emergency patients. 2. Training and examination supporting ECG, emergency scenes, cases, CPR training and examination. 3. Emergency scenes script training /assessment: Dozens of emergency scenes are available, covering VF, Pulseless VT, Pulseless electrocardio activity;these will help physicians practice emergency operation procedures of different cardiac diseases.